The Blog That Time Forgot: 80 Years of Conan: "Cimmeria"
80 Years of Conan: "Cimmeria"
The more I reviewed the introduction's appraisal of Conan's literary origins in Howard's work, the more I felt one "immediate predecessor" deserved proper inclusion into the Conan canon, and that there was even more to say about this particular piece. The fact that it has been included in several Conan anthologies - particularly the Del Rey collections, as well as countless public domain books - just strengthens the case. 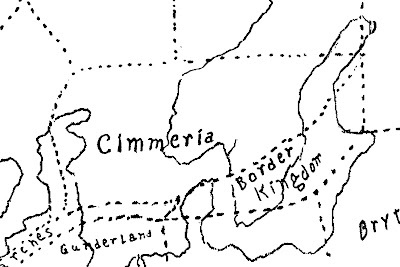 So before we get into the first Conan story, let's look a bit more closely at "Cimmeria." 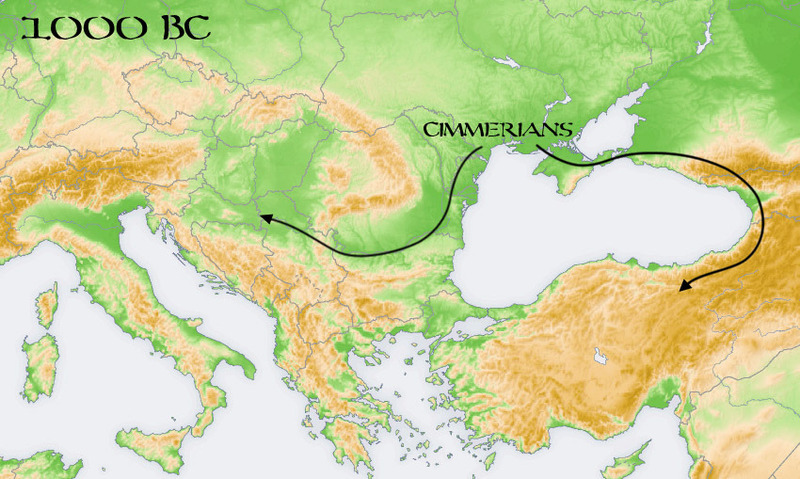 As most will know, the origin of Howard's Cimmerians was the mysterious and still poorly-understood tribe of nomadic horsemen which dwelt around the north of the Black Sea in antiquity, and by extension, the contemporary meme which cast Cimmeria as the origin of the Celts, including the Welshs and Gaels. 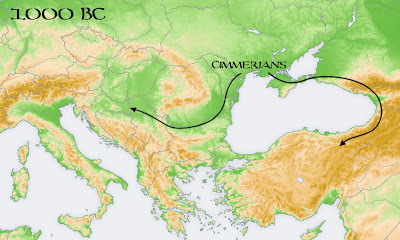 Of course, the history and historiography of the factual Cimmerians is a fascinating discussion in and of itself: nonetheless, it's important to understand what Howard knew and felt about the historical Cimmerians when talking about his fictional offshoots, and not colour it with post-1930s discoveries and theories. Then there were that strange fierce people who came suddenly and terribly into southern Gaul and Italy – the Cimbri, who because of their association with the Germanic Teutones, many historians, including Plutarch, supposed them to be Germans. At any rate, old historians such as Plutarch and the like, tell us plainly that the Gauls were grey or blue eyed and yellow haired. So were the Britons, while the Gaels, who probably more nearly approached the original Celtic type, were generally grey eyed and dark, rather than blond, with dark brown or black hair. There are some that say, that the country of the Celti, in its vast size and extent, reaches from the furthest sea and the arctic regions to the lake Maeotis eastward, and to that part of Scythia which is near Pontus, and that there the nations mingle together; that they did not swarm out of their country all at once, or on a sudden, but advancing by force of arms, in the summer season, every year, in the course of time they crossed the whole continent. And thus, though each party had several appellations, yet the whole army was called by the common name of Celto-Scythians. Others say that the Cimmerii, anciently known to the Greeks, were only a small part of the nation, who were driven out upon some quarrel among the Scythians, and passed all along from the lake Maeotis to Asia, under the conduct of one Lygdamis; and that the greater and more warlike part of them still inhabit the remotest regions lying upon the outer ocean. These, they say, live in a dark and woody country hardly penetrable by the sunbeams, the trees are so close and thick, extending into the interior as far as the Hercynian forest; and their position on the earth is under that part of heaven, where the pole is so elevated, that by the declination of the parallels, the zenith of the inhabitants seems to be but little distant from it; and that their days and nights being almost of an equal length, they divide their year into one of each. This was Homer's occasion for the story of Ulysses calling up the dead, and from this region the people, anciently called Cimmerii, and afterwards, by an easy change, Cimbri, came into Italy. All this, however, is rather conjecture than an authentic history. She came to deep-flowing Oceanus, that bounds the Earth, where is the land and city of the Cimmerians, wrapped in mist and cloud. Never does the bright sun look down on them with his rays either when he mounts the starry heaven or when he turns again to earth from heaven, but baneful night is spread over wretched mortals. It is arguable whether "Cimmeria" be counted as part of the Conan canon, especially considering it predates the first Conan story: if anything, Cimmeria would be retroactively added. However, there are several indications that Howard may well have considered "Cimmeria" to indeed be part of the mythos. First, comparing select phrases and descriptions yields many points of convergence. And the lone winds that whispered down the passes. Slope beyond slope, each hooded like its brothers. Cimmeria, land of Darkness and deep Night. I have forgot the very name men called me. The dimness of the everlasting woods. 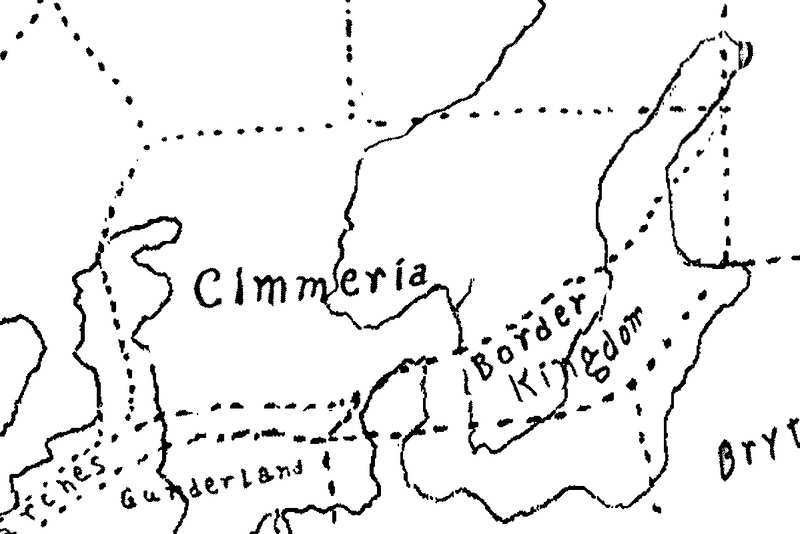 Cimmeria, land of Darkness and the Night. “Life seems bitter and hard and futile. The men of those dark hills brood overmuch on unknown things. They dream monstrous dreams. Their gods are Crom and his dark race, and they believe the world of the dead is a cold, sunless place of everlasting mist, where wandering ghosts go wailing forevermore. They have no hope here or hereafter, and they brood too much on the emptiness of life. I have seen the strange madness of futility fall upon them when a little thing like a spinning dust-cloud, or the hollow crying of a bird, or the moan of the wind through bare branches brought to their gloomy minds the emptiness of life and the vainness of existence. Only in war are the Cimmerians happy." “Well,” grinned Prospero, “the dark hills of Cimmeria are far behind you. Now we see specific and undeniable parallels: "endless vistas," "hills beyond hills," "winds... moan drearily among the passes/lone winds that whispered down the passes," "moan of the wind through bare branches/bare boughs rattling in the lonesome winds." Their gods are Crom and his dark race, and they believe the world of the dead is a cold, sunless place of everlasting mist, where wandering ghosts go wailing forevermore. They have no hope here or hereafter, and they brood too much on the emptiness of life. Patrice Louinet put forward the theory that "Cimmeria" is a reincarnation poem, but I have to wonder if Howard may have subconsciously recast it as something else. Perhaps the unknown rememberer is not a man of the distant future recalling an ancient past: perhaps he is a wanderer in that realm of everlasting mists which the Cimmerians perceive awaits them after death, where the only thing that made them happy - the hunt, war, conflict - was but a distant shadow. Indeed, if I could perpetuate the idea of a certain ghost-king retelling his tale, perhaps the finale of Conan the Cimmerian's legend is a sombre and gloomy one. And triumphant refuse eternal fame. And humbly stepped aside to make his way. And strides into the dusk ... toward other lands. Thank you very much for the splendid sonnet. I feel deeply honored that a poem of such fine merit should be dedicated to me. You seem to grasp the motif of my stories, the compelling idea-force behind them which is the only excuse for their creation, more completely than any one I have yet encountered. This fine sonnet reveals your understanding of the abstractions I have tried to embody in these tales. In response to your request for an ms. copy, I am sure I can find something of the sort, when I rearrange my files, which are at the present in a chaotic state. In the meantime I am enclosing a so far unpublished bit of verse, “Cimmeria”, for your notebook. Hope you like it. In response to a poem about Conan the Cimmerian, where Howard notes the author seemed to understand the motifs, idea-force and abstractions embodied in the stories, Howard sends the author a copy of "Cimmeria." By no means is it rock-solid, but I believe it to be sufficient circumstantial evidence that Howard, at least retroactively, considered "Cimmeria" part of the Conan mythos. This wouldn't be the only case of this phenomenon: Tolkien didn't write The Hobbit as a prelude or prequel to The Lord of the Rings, but he certainly thought of it that way after the latter's publication, even going so far as to rewrite the original book so as to better coalesce with the grander story of Middle-earth. If Howard did not write Cimmeria with the intention of its place as the beginning of a saga, perhaps he came to recognize it in retrospect. Thanks Ben! I must've missed the cloudy version: ah well, I'll post that next. Very much enjoying the States, and looking forward to talking to you too! Very interesting obsevations.I would like also Al to draw your attention to Celtic Frost's "Circle of the Tyrants" song from their excellent "To mega-therion" album from 1986. The lyrics use Howard's Cimmeria poem in part toward the end to build around a story of after the kingdoms are won, the battles are over and so forth. Their interpretation of "Cimmeria" also seemed to be taken as looking back on the emptiness of vitory and glory in war. I think the poem should always remain an unofficial part of the Conan canon if only for one reason and that is that when he wrote it Conan was still the seed of an idea in Howard's mind's eye. The line that the narrator of the piece has- "forgotten the very name men called me" adds to the mystery, myth and grandeur of the saga on a whole. "Cimmeria" is an intriguing exercise in formation and prose and gives an insight into Howard's mind on how he started to formulate the beginning of Conan's saga.I am glad it is included in the new collections. Good point. I think the narrator's "forgotten" name is important to consider. Nonetheless, as you say, that just adds to the mystique. I'll have to check out "Circle of the Tyrants": I've still been listening to Manilla Road's Howard works whenever I get the chance. You have exclusive rights to capture the elusive hairy Scotsman on camera, Mr DeMille, so long as you have no plans to create life decoys or soul extraction using said footage. Really great stuff, Al. I am ashamed to have stayed away from "The Blog That Time Forgot" lately. I plead desperate efforts to produce some more work and get it published. But I'm now about to browse your website the rest of the night. Stay well! Shame is unnecessary, Keith, and in any case, you picked a good time to come back: I'm finishing up "Phoenix" and getting ready to delve into "The Frost-Giant's Daughter." 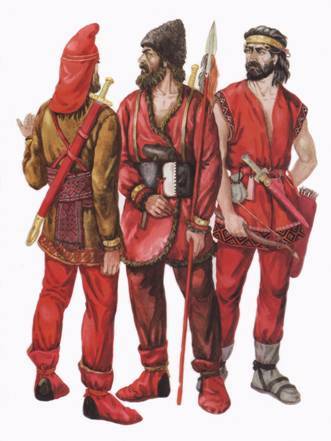 Why are the Cimmerians in one of the pics above dressed in red? Any special meaning in it? I'm not aware of any special meaning, Caturo, I think it's just the choice of the artist.